Yamaha Motor Co., Ltd. Is the Japanese company was well known for its musical instruments, but in 1955 it began producing motorcycles. The Yamaha Fazer 25 was launched by Yamaha on 21 Aug 2017. Yamaha Fazer 25 is an aggressive bike with its heart of touring and soul fire! Yamaha Fazer 25 offer benefits like low maintenance, good real-world performance, and a full fairing! 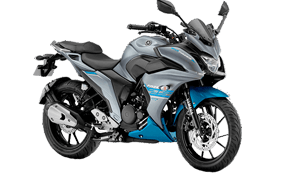 The company wisely brings out a faired variant of the motorcycle, with the Indian two-wheeler enthusiast's fondness for a faired motorcycle, the Yamaha Fazer 25. Yamaha Fazer 25 has an all-new LED position light and an aerodynamic cowl with wind protector. Yamaha Fazer 25 is available in two color options: Rhythmic Red and Soulful Cyan. The new motorcycle features the same LED headlight as seen on its street bike sibling but it also features a unique accessory that is a large windscreen to protect the rider from wind blast at high speeds. The fairing has integrated LED DRLs and dummy air scoops on both sides of the headlamp. It also gets a tinted floating fly screen. Suspension of Fazer 25 includes telescopic front forks and linked rear monoshock. Braking is via disc brakes on the front and rear. Yamaha Fazer 25 has Tires that are hungry for asphalt, the power that craves for distances, the muscle that loves to fight the rough, and agility that is always ready to embrace the surprises planned by the zigzag roads of Indian. It is best for the Indian bike riders. Yamaha Fazer 25 comes equipped with an air-cooled 250cc engine that churns out 20.9PS power @8000rpm and 20Nm torque @6000rpm. The engine of Yamaha Fazer 25 is mated to a five-speed gearbox. The new Yamaha Fazer 25 shares its underpinnings with the FZ25. Suspension duties are handled by telescopic forks at the front and a monoshock at the rear. Braking prowess is offered by a 282mm disc with a 2-pot caliper at the front and a 220mm disc with a single-pot caliper at the rear. The Fazer 25 also doesn't feature ABS as an optional extra. The new Fazer gets a full fairing which takes its weight to 154kg and has been pitched as a comfortable sports tourer. The Fazer 25 has a 14-liter fuel tank and the expected fuel efficiency is 43kmpl. The unique hemispherical combustion chamber of the bike, plated cylinder, and thin piston rings, the lightweight forged aluminum piston, together deliver a high performance with heightened aggression. 1. Comprehensive Policies – Comprehensive policies provide the cover against different types of wear and tear on the motorbike and the individual rider of the vehicle. 2. Liability – only Policies – Liability – only policy cover only the injuries to the individual that he or she suffered from the third party action.